THE ULTIMATE OLD SKOOL EXPERIENCE? As you know, Raiden was more or less (we’re speaking of the first game in the series, mind you) a doujin game: graphics were simple;sound too, gameplay was based on some Toaplan titles, like Flying Shark. 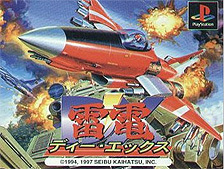 It is not a case that the second’s stage song, “Gallantry”, is a blatant cover of second stage’s tune of said Toaplan game. The first Raiden introduced the secondary weapon (well, maybe i’m missing other shmups which had such device before Raiden, in case please ignore this comment ) and refined a gameplay style…its sequels just improved this formula to a basically perfect level. Let’s see why. Let’s be honest: the first chapter didn’t have graphics that could compete with jaw-dropping gfx of games like Xexex or Metal Black. Raiden DX, instead, is really charming:it’s really difficult to find negatives aspects about its looks. All enemies have been carefully drawn and are full of details, with nice scaling effects when you shoot aerial baddies and you see them falling on the ground. Details abound in the backgrounds, which are also nice and very colourful: just to give you an idea, every enemy explodes in many pieces,with debris flying all around.If the said enemy is aerial and crushes on destroyable scenery like houses or forests, it will also damage them, leaving a few carbonized branches, for instance. If this wasn’t enough, all larger vehicles are well-animated,with details like rotating turrets, jet streams changing colour once the engines are fully turned on, other many elements that show how much attention they put in the game. Maybe the design isn’t too unique (even if all the vehicles have that distinct raidenesque style), but that’s not really a problem, after all. Graphics are top-notch, full of details and with a lot of animated objects, basically top-notch. The only weak point of this game is the BGM. In short, the original BGM was pretty weak, mainly because it sounded like generic game music without too much inspiration. Most of the themes are simply pretty bland, not fitting too much with the quite hectic pace of the action. Seibu had it right with the psx version: fast-paced music, basically rock-like, with a very edgy tone:this is exactly what a game like Raiden DX needs to give a sense of fast pace, especially with the three space themes (the themes of the last three stages, which are obviously set in space). If this isn’t enough, you can trigger the Viper Phase one OST by meeting some criteria while completing one of the courses, so you can blast enemies with VP’s groovy “space opera” music (actually, a sort of electronic rock with a vague “space-themed flavour”). One excellent note must be written for sound effects: they’re all very detailed, being a sound complement to the richness of particulars to be found in all other aspects. The original music is so-so, so change to the new version or the viper phase one version, once you trigger it. Let’s explain briefly how the game plays, leaving the details to the the ST: You have a main weapon and a secondary weapon. The main weapon comes in three flavours: spread (red), piercing laser (blue), homing laser (purple:the so called “kid colgate attack”). The last attack works in this way: you tap to heat the laser, so you trigger a fluxus that locks on onto an enemy and damages everything in its path.You can overlap it on itself, like a string (of sorts). You have two secondary weapons, homing and straight missiles (green and red). You also have two types of bomb (red and yellow, or nuke and napalm, the second one being faster in activation).About scoring: you have bonuses and secrets, in order to score. Bonuses are medals and miclii: the medalsflash, fading away after a few secs. They will flash again for a while, then fade out once and for all, being worth 3k (10k) in that brief moment. Miclii (the blue dragons) work in the same way, except they’re worth 50k if taken when they do the dashing animation. Beside that, you can take up to 7 bombs, if they’re of the same colour, every extra bomb is worth 50k.Not only that, bombs are multiplied per the medals taken since your last death, at the end of a stage, to grant you a potentially conspicous bonus. Last but not least, you have three different missions to choose from: Alpha, Bravo, Charlie (Training, Novice, Expert). Training is one huge stage with just a boss, novice is a tweak of Raiden 2’s first five stages, Expert is entirely new (and with a facultative ninth stage). All missions share the golden piramids, secret items worth 200k, but other secret items vary according to the misssion.Finally, after completing a game or a loop, you get three bonuses based on “Guts” (how many risks you’ve taken in your play), secrets uncovered, enemies destroyed. As you can read, there are a LOT of options and scoring opportunities. The game features the classic raiden weapon system and a pretty articulated scoryng system, not to mention the different scoring options related to the three missions. The difficulty can be pretty difficult to manage, but that’s only intimidating (not even bad) thing about the game. 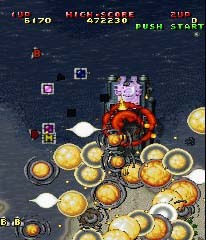 Raiden DX is quite a complex and articulate game, since the three mode are slightly different in the “secrets” mechanics and the Charlie mission (Expert mode) .Not only that, but Charlie and Alpha missions are not a simple recycle of the second installment of the series (Beta consists of the first 5 stages of said version with minor tweaks), but fresh challanges by themselves. 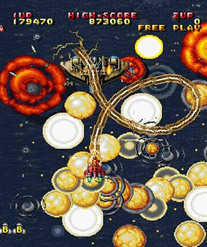 Beside that, the scoring system is so ductile and elaborate that the player can really approach the game in the way he likes, still having plenty of room if he wants to discard elements he doesn’t like:For instance, as long as you don’t die and you don’t bomb, you will surely get good bonuses at the end of the stage:add the golden pyramid at every stage, and you will already have excellent scores (read: about 300k points in bonuses). Once you can complete game on some of the easier settings, you can also trigger a few extras, something i invite to discover by yourself (one is the Viper Phase OST! ).Beside that, you have to deal, after all, with a rock-hard, but still well balanced (ok, please don’t throw stones at me after this comment!) 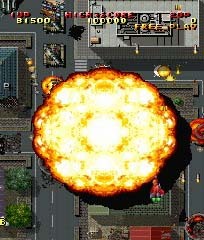 shmup, probably the most refined “old skooler” ever. The game offers an infinite longevity in the form of three different courses of difficulty, all with slightly different mechanics, and a very challenging but fair difficulty.Beside that, it represents a peak in the “old skool” style. Obviously, a bomb. One thing I dont like about Raiden DX smartbombs, and Raiden bombs in general, is that they take a few seconds to deploy. Just long enough to get yourself killed in the interim. I couldn't find many pics for you Rando, so I resorted to nicking them. This is a blurry shot of a bomb going off, one of the scattery kinds. There's some pickups... I do love the purple weapon, I'll see if I can find any pics of that. I remember years ago calling this the Toothpaste Laser, and the term seems to have stuck. I am famous at last. I wonder if the developers call it that yet? For a series that had humble beginnings, Raiden DX represents a pinnacle of perfection in terms of gameplay and graphics, what it lacks to be perfect is a better original soundtrack.